Decorations should be understated at teen parties. A teen pool party is a great way to celebrate a summer birthday, graduation, the Fourth of July, or just to turn a hot summer day into a special occasion. 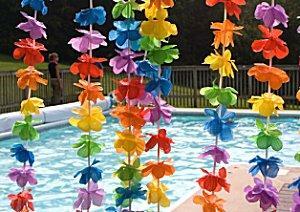 Before throwing a pool party, it is important to decide whether or not the party itself will be themed. If visiting a local pool or water park is a unique occurrence, no extraordinary theme may be necessary. On the other hand, if splashing in the backyard pool is common, a theme can turn it into something exciting. The key to a great teen party theme, however, is to remember not to overdo it. Many teens would prefer an understated theme that hints at coordination instead of an outrageous theme that may backfire. With or without a theme, there are several basic necessities every pool party requires. Because the party will revolve around water activities, it is best to keep food light: sandwiches, hot dogs, fruit, cookies, snow cones, and cool drinks are great options. Silverware should be limited (opt for cupcakes instead of a birthday cake, for example). Glass plates, bottles, or cups should be avoided to prevent accidents that could cut bare feet. Barbeques are great options for pool parties as well, but be sure to offer vegetarian options for conscientious teens. Coordinated party games are not usually necessary for teen parties, but having fun pool activities available will encourage teens to entertain themselves. Beach balls and volleyballs are popular choices, as are different floating pool mats and lounges, diving sticks, and water guns. Appropriate calypso, steel drum, and beach-oriented party music (the Beach Boys are a great choice) can add even more fun and may inspire an impromptu limbo contest. While most teens will bring their own supplies, having extra on hand will ensure that everyone can have a great time even if they forgot something essential. It is also advisable to have an extra swimsuit or two available if necessary. What starts out as a fun party can quickly get out of hand with rambunctious teenage energy. To ensure pool safety, be sure the pool area is clean and free from debris that could be stepped on, tripped over, or used inappropriately. Remove unnecessary equipment (hoses, children's toys, etc.) from the area to free up space and eliminate temptations, and before guests dive in, be sure they understand the safety expectations. Horseplay and dangerous stunts should not be tolerated at any time. A teen pool party isn't just about having fun in the water. There are plenty of ways friends can enjoy pool-oriented activities before they dive in, and many of these activities can also be used to space out eating and swimming to prevent potential cramps or injuries. A teen pool party can be a fun summer event, and with appropriate food, activities, and other essentials, the party is sure to make a big splash on the teen social scene.